Gulf of California or Sea of Cortez is the narrow sea that is sandwiched between Baja California and Mexico. For those who don’t know, Baja California is the 775 mile long peninsula of Mexico that runs almost parallel with the mainland Mexico like the trunk of an elephant. Let us know some more facts about the Gulf of Cortez. Spanish invader Harnan Cortez was first to send expeditions to the gulf. The earlier Spanish explorers believed that there is an island of California which is nothing less than a paradise on earth. There search was for finding out that mythical island. That is why the gulf is also called as the “Gulf of Cortez”. Longitude: 106 deg 35 min (East) and 114 deg 40 min (West). 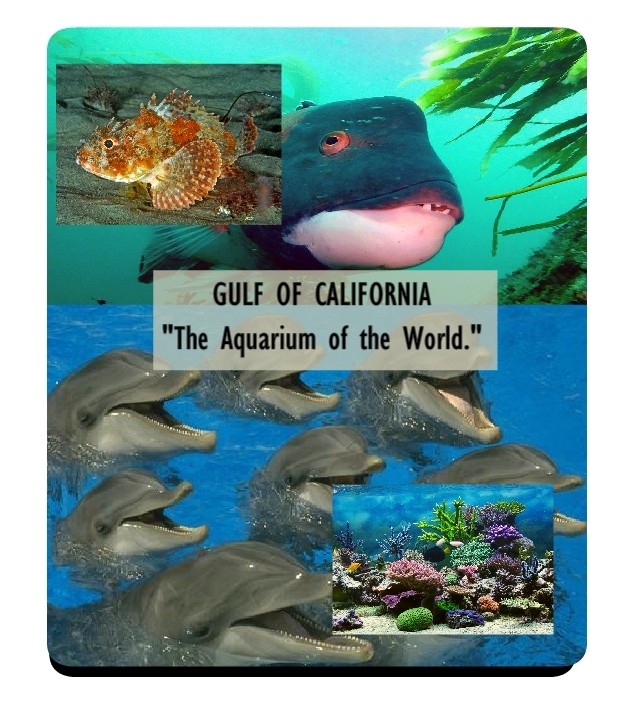 The Gulf is a part of the Pacific Ocean, the largest of all five oceans. It is situated in the eastern shore of the ocean and the western shore of the continent of North America. It is in the area between pure North America and Central America. Look at the map of the Gulf of Cortez and you can understand clearly about the shape and location of the sea. 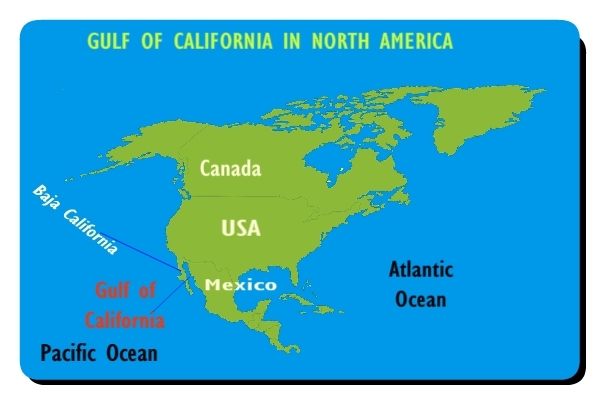 This second map will help you to understand the position of the Sea of Cortez in the continent of North America. How Deep and Wide is the Gulf of California? The mean depth of the Gulf of California is 818.08 m (2,684.0 ft). But in most places the gulf is less than 180 m (600 ft) deep. But there are some deep points in the southern part. Some of these points are more than 3000 m (10000 ft) deep. The gulf is about 1200 km (750 mi) long. It is average 153 km (75 mi) wide. The widest part is the mouth where the gulf meets with the ocean. 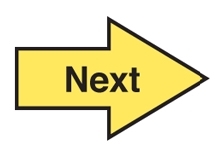 There one needs to go 320 km (200 mi) to cross it. The Gulf of Cortez came into existence in 5.3 million year ago. It is the time when Miocene epoch comes to an end and the Pliocene epoch is about to begin. It is the youngest sea on earth. 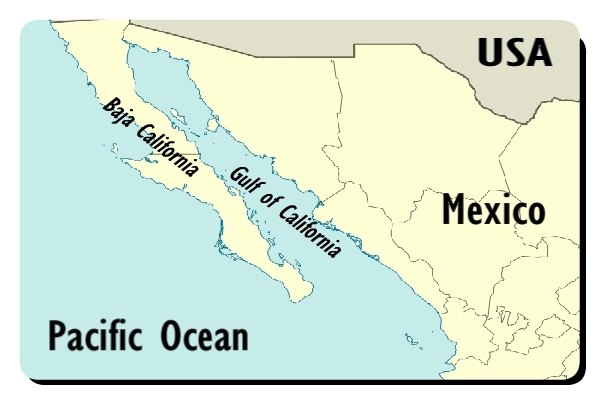 The Baja California was once a part of the North American plate. It was rifted of from the mother plate by violent tectonic forces. The gap was filled by the water of the Pacific Ocean. The process is not totally complete even today. "Gulf of Cortez is the youngest sea on earth." The average water temperature across the gulf has little difference in winter and summer. While the lowest average is 16 deg C ( 21 deg F), the highest is 24 deg C (75 deg F). But there are wide regional variations. Water of the northern part of the gulf becomes cooler than the southern part in the winter. Sometimes, it becomes so cold (under 10 degrees C) that thousands of sea creatures die within days. Gulf of California has some great and popular beaches. These are frequented by tourists from USA and Mexico. The Mexican city La Paz (the capital of the state Baja California Sur) is the most popular for it. Los Cabos is another city of great beaches. It is situated at the boundary point between the gulf and the Pacific. There are also some island beaches which attract many nature lovers. Beaches are made of sand and very small smooth stones. But there are also two more types of shores. There are many rocky shores made of both hard and soft rocks. The shores with softer rocks support more marine life. Due to it funnel shape the gulf experiences high tides. That has created many tidal mud flats. There are many islands in the Gulf of Mexico. Most of these islands are very small. The total number is 37. Two largest among these are Guardian Angel Island or Isla Angel de la Guarda and Tiburon Island or Isla Del Tiburon. 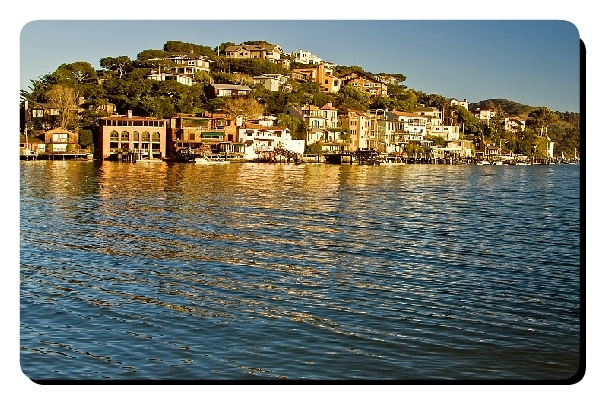 With an area of 1200 sq km (464 sq mi) Tiburon Island is the largest in the gulf. The island is mostly uninhabited and controlled by a tribal government in coordination with the federal government of Mexico. The Angel Island is the 2nd largest among the lot. It is a dry land with no source of water. 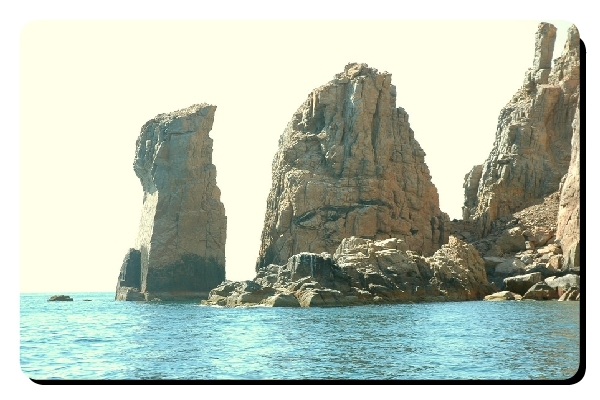 There are a series of mountains in the island with a maximum height of 1300 meter from the sea level. The island is known for its biodiversity. 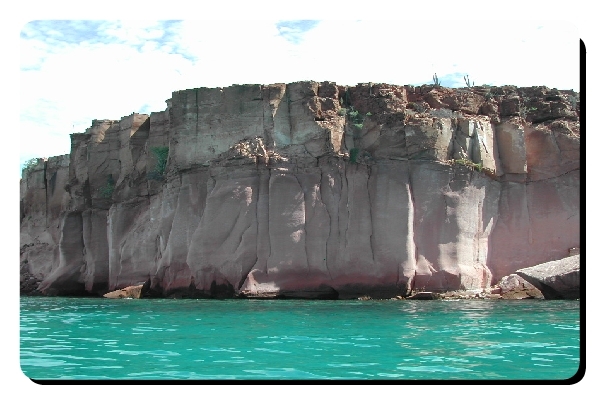 Watch the video to see some of the islands namely, San Jose, San Francisco and Espiritu Santo. Islas Marias or Mary Islands is a group of 4 islands. There are some people living in these islands. These islands are also considered as Biosphere Reserve by UNESCO. Puerto Balleto is the largest settlement and town in these islands. Carmen Island is another important island mostly known for its city of Ciudad del Carmen. The city is populated by over 200000 people. It is also in industrial hub for its oil production. 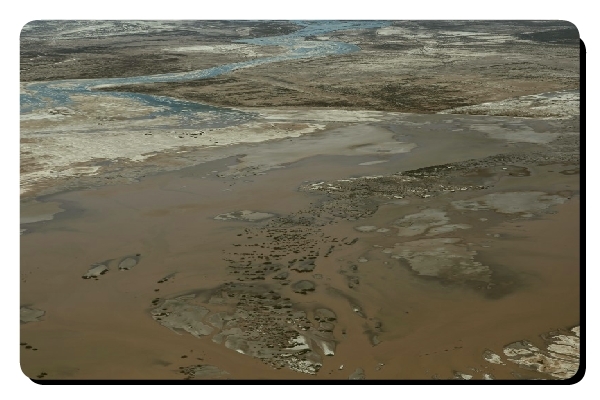 There are many rivers that flood the Gulf of California with fresh-water from the mainland and the peninsula. River Colorado is the largest among these. That river is 1452 mi long. Fuerte is a small river with only a 336 mi course. Other small rivers include Sonora, Yaqui, Sinaloa, Mayo, Concepcion, San Lorenzo, Sonoyta etc. These rivers form many estuaries important for bio diversity. The gulf is one of the most bio-diverse regions of the world. There are many coral reefs, estuaries, sea grass beds and rocky sea beds full with diverse marine life. 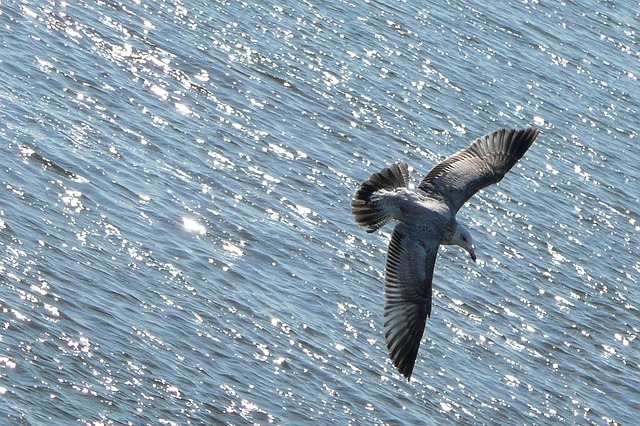 There are many endemic species inhabit in the gulf. Most famous among these is the porpoise named Vaquita. That animal is critically endangered. Without proper conservation the cetacean can be extinct very soon. There are hundreds of sea-mammals live here. Different types of whales like blue, humpback, gray, fin, sei , pilot etc frequents here. There are many species of dolphins too like the bottlenose, long beaked, etc. There are also some sea lions too. Many species of tortoises are among the most notable of gulf animals. Some of these are leatherback, loggerhead, olive ridley, snappers, green etc. More than 900 types of fish lives in the gulf. Among these about 10% is endemic – that can’t be found anywhere else. Famous endemic species include totoaba, gulf weakfish, slow goby, gulf signal blenny, saw tail grouper etc. There are also many types of sharks and rays in it. The Gulf of Cortez is full with different types of sharks and their relative rays. 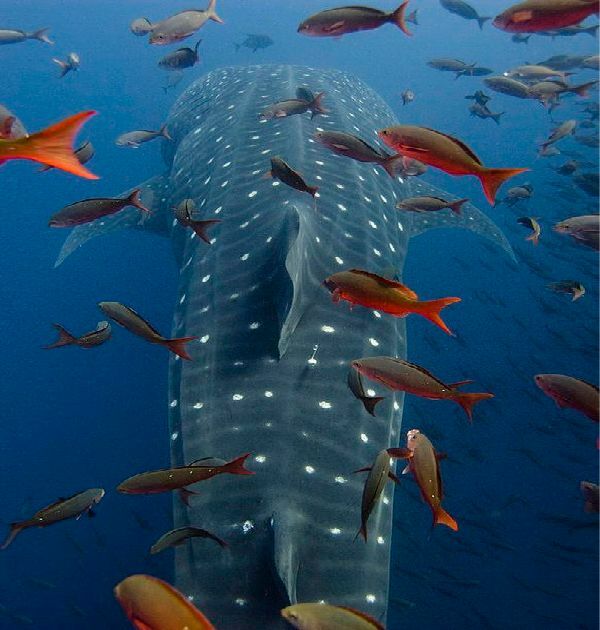 The largest fish of the world, whale shark is the most notable among all these. There are also sharks like great white, dusky, silky, blacktip, leopard, pacific angel, hound, bull, hammerhead etc. 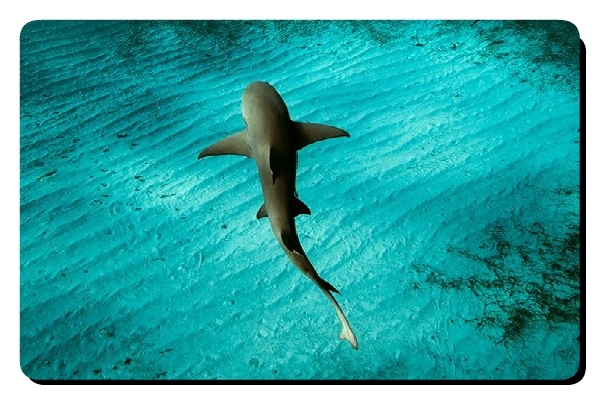 The number of sharks is rapidly decreasing due to overfishing by-catch and selective culling. Rays are related to sharks as both are cartilaginous fishes. Rays like diamond stingray, golden cownose ray, bat ray, eagle ray etc are very easy to spot in the gulf. The economy of the gulf is largely depended on fishery. The region is rich in number and variety of edible fishes and crustaceans. Blue shrimp fishery is one of the most important in the region. That crustacean is highly prized for high price and constant demand in the fish markets. Spanish mackerel, Bigeye Croaker, and gulf Corvina are the most important species of fish for commercial fishing. Overfishing and bottom trawling is a problem that has been destroying the ecosystem of the region. As a result, some species of fishes and other animals are in danger. 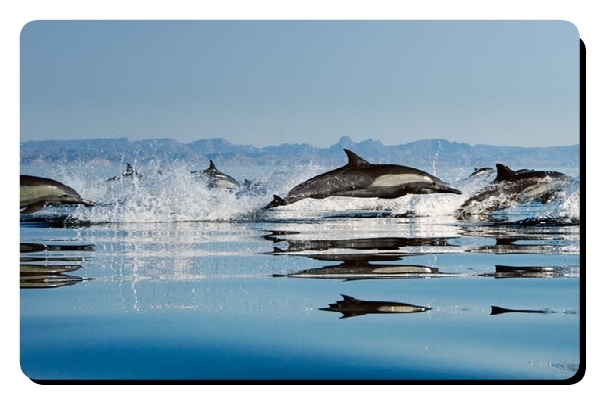 The environmental loss caused by human activities has done havoc to the biological diversity of the Gulf of California. 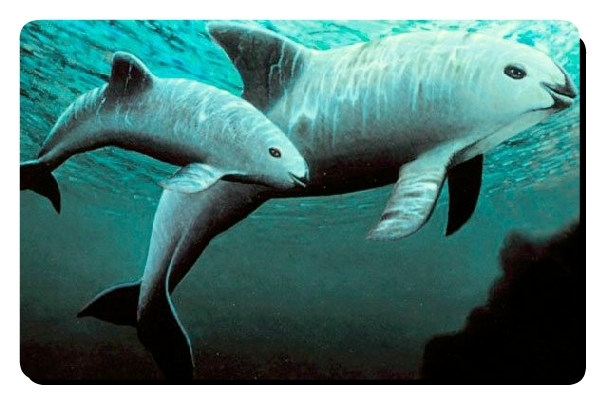 Vaquita, the smallest porpoise in the world, has become the most endangered marine mammal in recent years. It is believed that without joint effort by government and public, the species will be extinct very soon. Different types of whales are also in the danger list. Sharks and rays are becoming rare due to overfishing. All these species needs serious action from authorities and NGOs to survive. Log from the Sea of Cortez is book written in English by American author John Steinbeck. It was published in the year 1951. It is a nonfiction book. It records the author and his friend Ed Ricketts’ expedition in the gulf to collect marine specimens. These book is one of the reason behind the region’s popularity as a tourist destination in America. Feel free to ask anything about the gulf or share your stories about it. Have you been there anytime or planning to go there? You can also read about the famous bay of fundy. If you want to learn more about the Gulf of California you can check these resources.